It’s been an upside down couple of months. After much research and prayer, my “impatient patient” opted for the dietary change. For someone living in south Louisiana who is used to cooking with (and eating) meat, seafood, dairy, nuts and oils, a sudden transition to a totally plant-based diet required a very steep learning curve for everyone involved. So I dug into my vegetarian past, started studying more current research and food availability, and fired up the crock pot and the pressure cooker. I won’t go into the emotional rollercoaster part of all of this; that’s a whole ‘nuther story. We’re used to “dietary changes” taking a long time to show results, and we always wonder if they’re doing any good because there’s a lot of seemingly conflicting information out there when it comes to diets and nutrition. When I worked in the oncology field, I saw patients changing their diets in many ways, hoping that eating more fresh foods would tip the scales in the favor of health. Anyone who has struggled with weight issues knows that it takes time to see the results of a dietary change. That kind of slow, invisible and unknown progress is what we all expect. Imagine our shock when our Impatient Patient, under doctor’s supervision, discontinued all medication for high blood pressure because the IP’s blood pressure was, for the first time in decades (did you hear that? DECADES), controlled without medication. This happened within a month. In fact, within a week, the blood pressure stabilization had begun. Let me pause in my narrative to say that I’ve always been a bit skeptical of “fad diets.” There’s always a new diet (usually with a book and guru attached) that’s touted as being a cure-all. I’ve always felt that a sensible, balanced diet was the way to go. That, and regular exercise, have served me well for several decades. It takes a lot for me to say “wow, this diet is life-changing.” In fact, I’ve never, EVER said that, until now – because I’ve never seen it happen until now. Trial and error, experimentation, and some great guidebooks and cookbooks have paved the way. I also happen to love whole grains, and I’ve never met a vegetable I didn’t like (with the possible exception of beets). I’ve discovered that there are even people I know who are following this plan as well, and we’ve shared ideas and resources. Mr. Meat-and-Potatoes has even started enjoying a plant-based diet – and he LIKES it! If you want to learn more about Dr. Caswell Esselstyn’s plan for reversing heart disease, check out his book Preventing and Reversing Heart Disease. Other resources include Dr. Colin Campbell’s The China Study. There are more resources out there – I’ll include more in this space over time. The power of plants and prayer is what is getting us all through. I’m amazed that in spite of the extra time spent on grocery shopping (label reading!) and cooking, I have more energy. 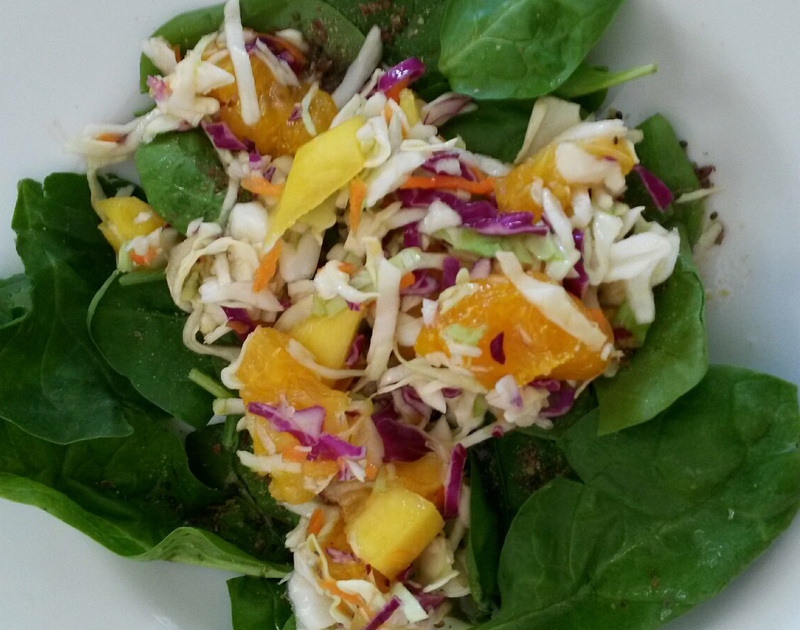 Right now I’m about to sit down to mango-mandarin slaw, take some whole grain bread out of the oven, and enjoy lunch! Toss, and enjoy. I served over baby spinach with some ground flax and chia seed.